(EM012) 20.09.09, limited to 60 prof. print CDr standard jewel case. Cosmic and dreamy ambient from US based artist Thomas Park. It is an essay on sublime space music. Hearkening back to early Brian Eno, the emphasis is on quiet melodies and limitless spaces. The first release in the "Cosmoaudiography" series. First 10 comes with A3 size poster. 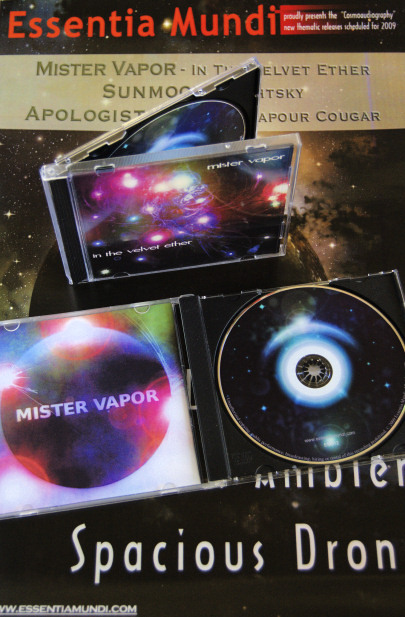 Mister Vapor is Thomas Park of mystified's drone ambient project. Thomas has been into music for over 20 years, and has been writing ambient electronic music for over 7 years. His focus is on dark but minimal and listenable music.